While Moody Gardens is fun and entertaining, it is first and foremost a nonprofit educational destination utilizing nature in the advancement of rehabilitation, conservation, recreation, and research. Which is why it is the perfect destination for a field trip! There is so much to learn and explore at Moody Gardens. Guided and unguided programs are available. There are three different fantastic field trip options to choose from. Students will get to experience hands-on fun with some of Moody Gardens’ exotic animals at The Learning Place. A guided tour through our “tropical classroom,” the Rainforest Pyramid, gives students the opportunity to observe interesting plants, exotic fish, and colorful birds from the rainforests of Africa, Asia, and the Americas. The trip includes a visit to the MG 3D Theater for a multi-sensory viewing of an educational film. An instructional presentation starts off this underwater adventure and is followed by a guided tour of the Aquarium Pyramid. In the underwater “classroom,” students observe exotic fish, unusual invertebrates, frolicking seals, and playful penguins. The Aquarium Pyramid features the underwater environment of the Caribbean, South Atlantic, North Pacific, and South Pacific. The trip includes a visit to the MG 3D Theater. 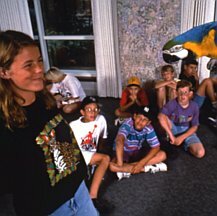 You can custom-design your own field trip by choosing your favorite attractions and creating a unique learning experience! Select a self-guided tour of the Aquarium Pyramid, Discovery Pyramid, a film at the MG 3D Theater, a simulated moving adventure at the Ridefilm Theaters, a ride on the Colonel Paddlewheel Boat (weather-permitting), or a multi-sensory experience in the 4D Special FX Theater. For more information on field trips, visit us online at www.moodygardens.com. Be sure to let your local schools know! For events in Galveston, be sure to check out Moody Gardens Attractions, Moody Gardens Golf Course, and Moody Gardens Hotel. We hope to see you soon!